In this Betwixtmas world between Christmas and New Year, what is there to do outside the backdoor? It’s either frozen solid or sodden, or worse still, both! We’ve had several mornings where heavy rain has fallen on icy ground, leaving me wondering why people all round the country are paying for the pleasure of ice-skating when they could just take a slide outside! It is a time, however, for reflection and for planning. In January Outside the Backdoor celebrates two years as a blog and I’m delighted to say that my WordPress statistics suggest that in 2017 I more than doubled both the views and visitors to the site, which is very rewarding, making it seem all worthwhile. So thank you to everyone who has shown interest and please do keep reading! So as we look back over 2017, what have been the highlights of the year from Outside the Backdoor? Well I can’t resist starting with an update on my yucca situation. 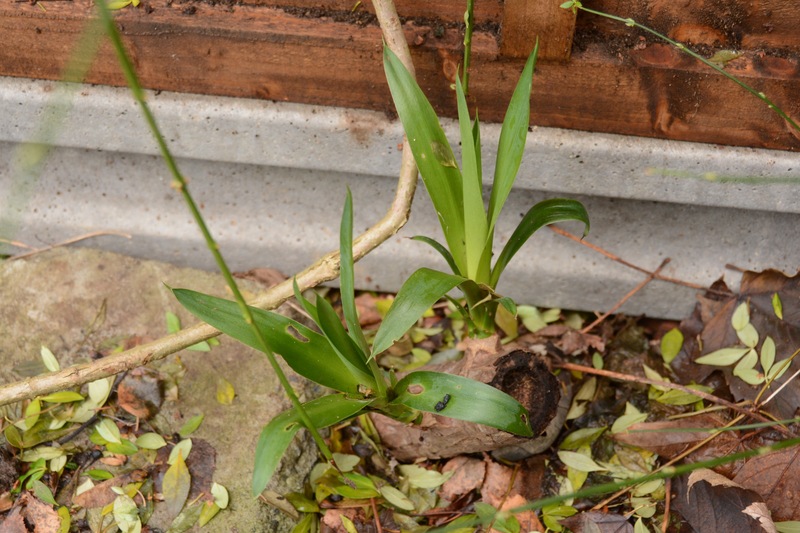 Back in October I wrote about Yuccas and me and, at that time the original stalk from which we had taken this year’s cutting, had been unceremoniously dumped behind the garden shed. It wasn’t our intention to leave it there for long but you know how it is. Imagine our astonishment when in the depths of November we were having a general tidy around the garden and John spotted that the stem was sprouting! We brought the pot back indoors and now we have a very healthy set of leaves emerging. And the yucca story doesn’t stop there. When we took the previous cutting, possibly in 2014, we used the old stem as part of the fill in under our fence to prevent the foxes tunnelling their way through. On a foray to the far end of the garden to inspect holly in the hopes of a berry or two for Christmas, John spotted that this stem is also shooting! What is going on?! These yuccas are obviously a good deal tougher than one might think! 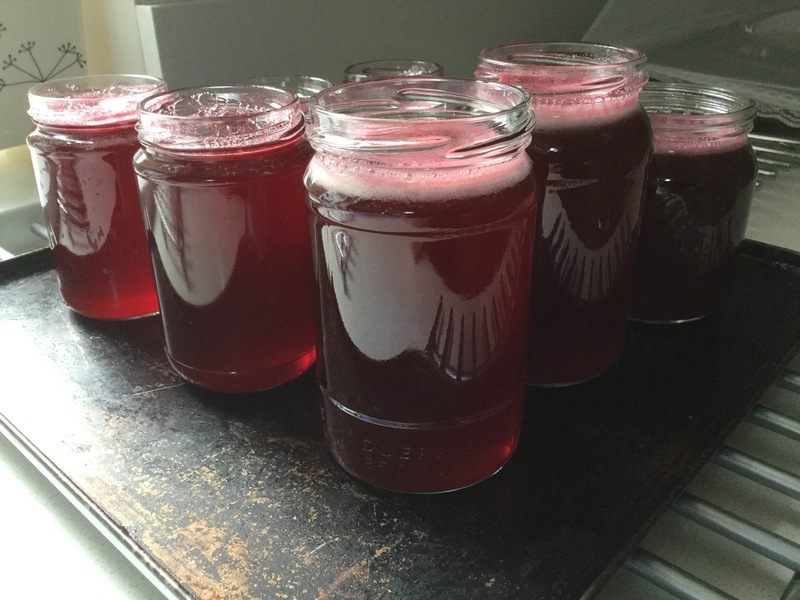 Another highlight of 2017 was definitely crab apple Laura who regaled us with spectacular blossom and a very generous crop of fruit in the autumn, resulting in many jars of jelly and a good contribution to church sales! Top of my local highlights list comes my new hot border. 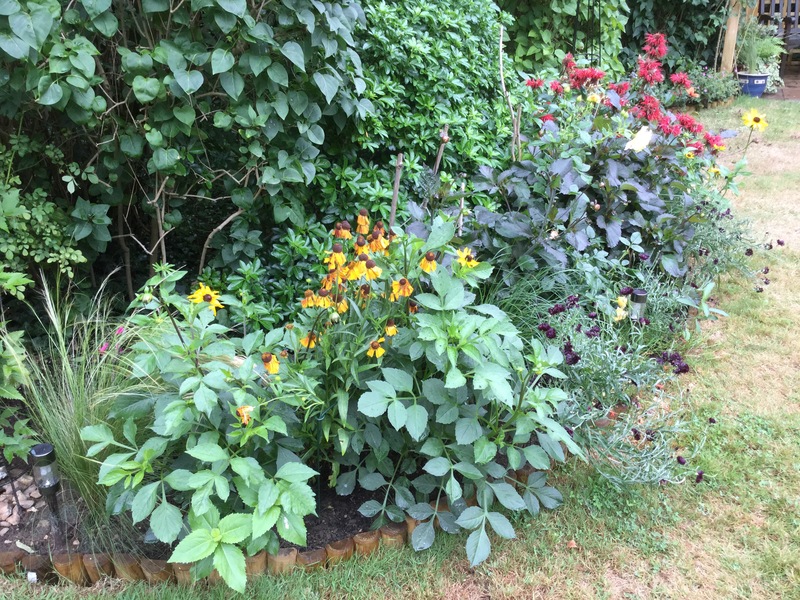 Dug and planted up in the Spring, it provided us with a stunning array of golden yellows, burnt oranges and fiery reds through into the autumn. In fact, the final flowers of the last rudbedkia only gave into the frosts in early December. This border was really rewarding and I am only left wondering why we didn’t create it sooner. In this period of looking backwards and forwards, there are two things I’d highlight from 2017 that I hope will come to pass in 2018. The first is a definite as it is already sitting outside the backdoor now waiting to be planted properly. We have acquired two new roses, one of which was inspired by our trip to Denmark earlier in the year and in particular to the spectacular gardens of Egeskov Castle. The Garden of Life, with its journey through time was exceptionally beautiful and we spent a disproportionate amount of our visit here admiring its planting. 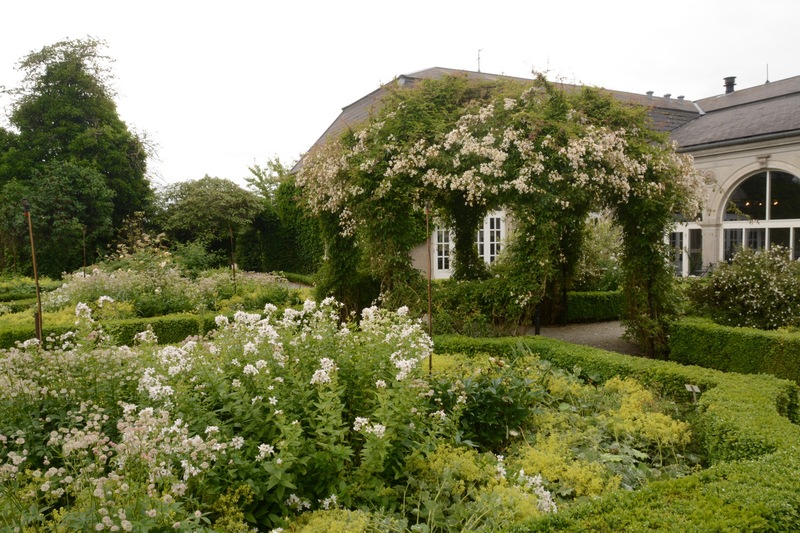 The White Garden was also stunning and both had a rose in common – a creamy white rambler with a gorgeous scent which we had seen flourishing elsewhere in Scandinavia. Courtesy of Peter Beales’ website, Rosa Helenae has since appeared in my Christmas ‘stocking’ – well, heeled into the veg plot as a temporary measure, to be more precise! 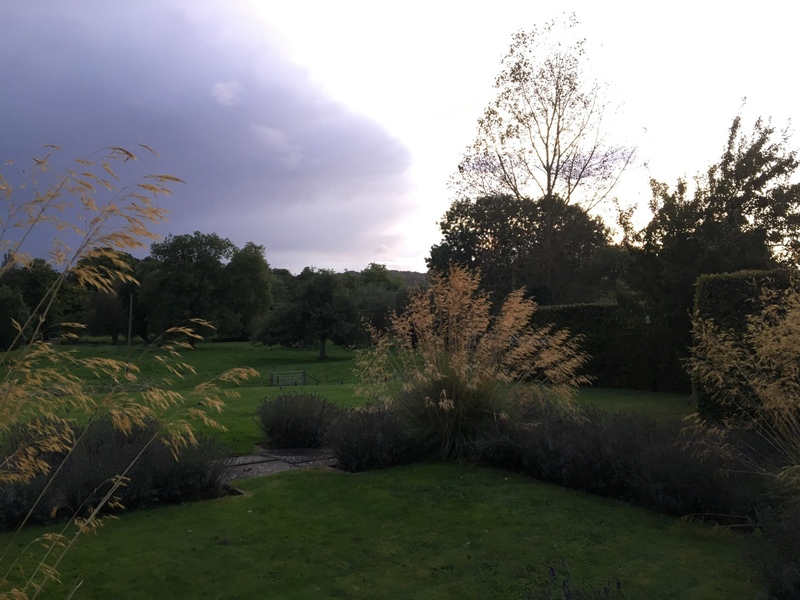 What hasn’t arrived yet, and it is probably only a ‘yet’, is a pot or two of Stipa Gigantea. A week away in early autumn was spent with a view of this golden grass greeting us every morning. We saw it in rain, wind and occasionally sunshine and left with a strong sense of ‘must have’. It is on the new year shopping list! What better way to end 2017 than devising a shopping list for 2018! And I’ve not even started browsing the seed catalogues that have dropped onto the door mat over the Christmas break – how timely! So as we say farewell to 2017, let’s look forward to the garden flourishing in 2018. Categories: Blog post | Tags: Blogging, Hot border, Laura, Yucca | Permalink. I have been the owner of a yucca plant since my 21st birthday! A pouring wet day just before my Finals at university and I remember everyone scuttling in and out of my room to wish me a happy birthday and then scuttling back off into the rain to revise. One friend knocked on the door and, when I opened it, I could barely see her as she was holding a not inconsiderable plant – a yucca! As you can imagine, the label was lost many years ago so I have no idea what sort of yucca other than it’s the one you still seem to be able to buy as a house plant should you feel so inclined. However, I would urge caution before popping one into your trolley on the next visit to the garden centre or DIY store. For the first eight or nine years of my yucca’s life it happily sat in its pot in my bedroom. I think I potted it on once or twice to give it some new compost. However, when we moved into our first house, we placed it in the dining room adjacent to the patio doors. It absolutely loved it there! Spurred on by all the light, it grew and it grew … and it grew! The most common question we were asked was, “What are you going to do when it hits the ceiling?” We were spared this decision for a little longer as, in the course of moving and being squashed into the front well of a Peugeot 205, it had developed a kink in its trunk which delayed the ceiling problem for a little while. Eventually we had to take the plunge and, having consulted a number of books (bearing in mind this was the days before the internet was ubiquitous! ), we chopped it in half! I can assure you that it took a huge amount of courage to do the deed and, if I remember rightly, the chosen tool was the bread knife as the trunk was too wide for anything as normal as secateurs. Following the instructions, we doused the newly cut base in hormone rooting powder, plunged it into compost and waited. We need not have feared, soon the top looked remarkably happy and was clearly getting taller. Meanwhile, to our amazement, the bottom began to shoot in two places and soon we had a double headed yucca! Of course, this only solved the problem for a year or two and soon the original plant and its offspring were also getting rather tall and so we repeated the process all over again. By the time we moved into our current house in 2000, we had no less than five yucca plants! My sister-in-law once commented that, if we didn’t have the plants, we would have had room for a three-piece band in the corner of the dining room! Eventually sense prevailed and we reduced our yucca numbers down to two. I can’t remember what happened to them all but at least one ended up a work and graced the university’s main reception for some years. 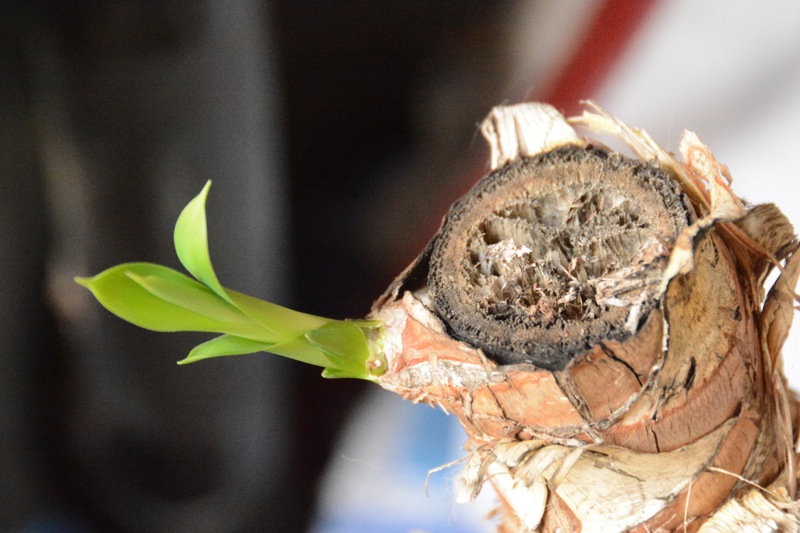 Our remaining yuccas continued to grow and, guess what? We built an extension with a high ceiling! It was a really good way of avoiding the problem again! In fact that summer, during the building works, we were amazed that the plants survived so well outside. As the build timescale extended, we were eventually chivvying the builders to get a move on so that we could get the plants into the warm before winter began. In 2015, it would be fair to say we hit a crisis – two yucca plants almost at ceiling height … again! So, it was out with the bread knife and rooting powder once more. We decided not to do both plants at once. Despite having done this process many times, we still lack confidence that we are going to be successful and only on that first occasion has the base of the old plant continued to flourish. I also didn’t fancy being left without any tall, structural plants in the lounge as they do look good in the high-ceilinged room. With our 2015 cutting now reaching a sensible height, this spring we had to do the inevitable and tackle the remaining tall plant. We left it later than usual. Not until the 29th May did we summon up the courage to man-handle it out of the backdoor and onto the patio for surgery! it is only now, four months on and with two or three brand new leaves emerging from the middle, do I feel we can say that we have another successful cutting and that the tradition of us owning a yucca plant looks set to continue for many years to come. I have now lost count but I think this cutting is now the fourth generation, making it the great-grandchild of the original! Categories: Blog post | Tags: Yucca | Permalink.